* Primary synovial sarcoma rarely originates in the renal parenchyma. When this occurs, origin of this unusual tumor type has been the subject of debate in the literature, with a suggestion that previously reported cases may be more correctly described as renal cell carcinoma with sarcomatoid dedifferentiation. Synovial sarcoma and sarcomatoid renal cell carcinoma may be indistinguishable on pure histologie and immunohistochemical grounds, but these tumors contain distinctly different sets of chromosomal abnormalities. Most previous cases of primary renal synovial sarcoma were confirmed by molecular biology techniques, which detected the SYT-SSX gene fusion transcript typical of this tumor, but no details of the other chromosomal anomalies have been published. We report a case of primary renal synovial sarcoma confirmed by standard cytogenetic analysis, showing the characteristic t(X; 18)(p11.2:q11.2) translocation and other chromosomal aberrations that are typical of synovial sarcoma as opposed to sarcomatoid renal cell carcinoma. If primary renal SS is indeed a form of sarcomatoid differentiation that arises from renal cell carcinoma (RCC), then it is reasonable to expect that the t(X;18)(p11.2:q11.2) translocation associated with the SS phenotype would occur within a cytogenetic profile characteristic of the underlying RCC subtype. Fifteen of the 16 previous cases of primary renal SS were diagnosed using reverse-transcription polymerase chain reaction to detect the SYT-SSX gene fusion transcript caused by the t(X;18) translocation,2,3 whereas in the one remaining case a t(X;18) translocation was identified by cytogenetic analysis but no further karyotypic details were published.2 Therefore, the background cytogenetic profile of these tumors was unknown. VVe present a case of primary renal SS assessed by standard cytogenetic analysis, which confirms a karyotype that is characteristic of SS as opposed to RCC with or without further genetic aberrations. 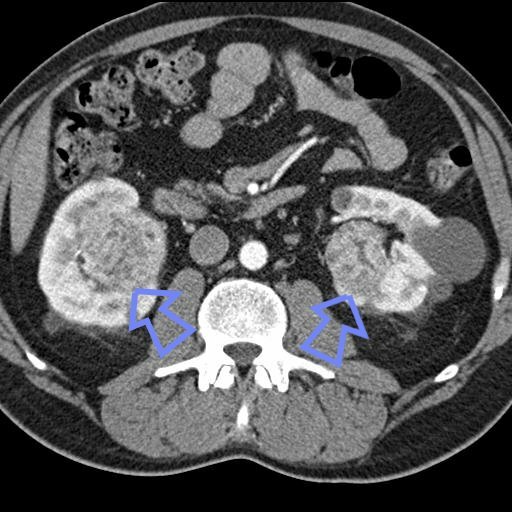 Following an episode of macroscopic hematuria, a 60-year-old man underwent radical nephrectomy for a radiologically confirmed right-sided renal mass. After receipt of the pathology report, computed tomograms of the chest, abdomen, and pelvis showed no other lesions or evidence of metastatic disease. The patient made an uneventful recovery but developed pulmonary metastases 6 months later. Despite an initial response to chemotherapy, which included imatinib plus 5 cycles of alternating vincristine, adriamycin, and cyclophosphamide or cisplatinum and etoposide, he died 12 months after initial diagnosis. Routine tumor samples were fixed in 4% buffered formaldehyde and embedded in paraffin wax. Four-micrometer sections were assessed by routine hematoxylin-eosin stains and immunostains for vimentin (3B4, 1:50; Dako Corporation, Carpinteria, CaIiO, cytokeratin (AE1/AE3, 1:50, and CAM 5.2, 1:100; Dako), desmin (D33, 1:100; Dako), S100 protein (Z0311, 1:100; Dako), and CD117 (c-Kit) (M7140, 1:100; Dako). A fresh tumor sample was subjected to routine cytogenetic analysis.6 Chromosome analyses were conducted on 20 G-banded metaphases. 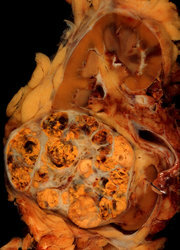 A 38 Ã— 29 Ã— 32-mm, ill-defined tumor mass was identified in the renal medulla. The tumor was associated with an area of central necrosis and extended focally into the renal pelvis, which contained an abundant blood clot (Figure 1). Histologie examination revealed a hypercellular monomorphic sarcoma composed of fascicles of spindle cells (Figure 2). No evidence of epithelial differentiation was noted. Mitotic activity was high, with 3 to 5 mitotic figures per high-power field. Tumor infiltration of the renal pelvis and renal parenchyma was noted, along with extension through the renal capsule into the renal sinus and invasion into the main renal vein. Immunostains for S100 protein, desmin, and cytokeratin (Figure 3) were negative. Positive immunoreactivity was observed for vimentin and CD117 (c-kit oncogene product), which showed diffuse cytoplasmic staining. Cytogenetic analysis of 20 metaphases revealed 2 distinct but closely related karyotypes (Figure 4): minor cell line: 44,t(X;18)(p11;q11),?dic(Y;14)(p11;q11),add(1)(p13),-22 ; and major cell line: 43,t(X;18)(p11;q11),-Y,add(1)(p13), -14,-22. Both were near diploid and showed the t(X; 18) translocation characteristic of SS plus a rearrangement of the short arm of one chromosome 1 and monosomy for chromosome 22. The major cell line appeared to have arisen from the minor line, losing the Y;14 translocated chromosome and thus becoming monosomic for chromosome 14 and lacking Y. Although our results have established that the current case shows cytogenetic features more characteristic of SS than the complex karyotype of SRCC, it is conceivable that acquisition of the t(X;18)(p11.2:q11.2) translocation in a typical RCC could lead to evolution of a renal carcinoma to SS-like tumor. However, in such a case, we would then expect to also identify the specific abnormalities typical of the progenitor tumor, for example, deletion of 3p in conventional (clear cell) RCC, trisomies of chromosomes 3q, 7, 12, 16, 17, and 20 as associated with papillary RCC, or the hypodiploid karyotype with multiple monosomies (chromosomes 1, 2, 6, 10, 13, 17, and 21) associated with chromophobe RCC.19 We and other investigators15,17,20 have shown this frequent preservation of progenitor tumor karyotype in SRCC. Finally, because the tumor contained no epithelial component, we conclude that this case represents a monophasic SS rather than a RCC or SRCC with SS differentiation. We acknowledge Philip Alien, MD, Flinders Medical Centre, for his assistance. 1. Faria PA, Argani P, Epstein Jl, Reuter VE, Beckwith B, Ladanyi M. Primary synovial sarcoma of the kidney: a molecular reappraisal of a subset of so-called embryonal renal sarcoma. Lab Invest. 1999;79:94A. 2. Argani P Faria PA, Epstein Jl, et al. Primary renal synovial sarcoma: molecular and morphologic delineation of an entity previously included among embryonal sarcomas of the kidney. Am I Surg Pathol. 2000;24:1087-1096. 3. Kim DH, Sohn JH, Lee MC, et al. Primary synovial sarcoma of the kidney. Am I Surg Pathol. 2000:24:1097-1104. 4. Sandberg AA, Bridge JA. Updates on the cytogenetics and molecular genetics of bone and soft tissue tumors: synovial sarcoma. Cancer Genet Cytogenet. 2002:133:1-23. 5. Waisman J. Synovial sarcoma in the kidney. Am / Surg Pathol. 2001:25:971. 6. Pandis N, Heim S, Bardi C, et al. Improved technique for short-term culture and cytogenetic analysis of human breast cancer. Genes Chromosomes Cancer. 1992:5:14-20. 7. Ordonez NC, Soheir MM, Mackay B. Synovial sarcoma: an immunohistochemical and ultrastructural study. Hum Pathol. 1990;21:733-749. 8. Pelmus M, Guillou L, Hostein I, Sierankowski C, Lussan C, Coindre JM. Monophasic fibrous and poorly differentiated synovial sarcoma: immunohistochemical reassessment of 60 t(X:18)(SYT-SSX)-positive cases. Am J Surg Pathol. 2002:26:1434-1440. 9. Smithey B, Pappo A, Hill D. C-kit expression in pediatrie solid tumours: a comparative immunohistochemical study. Am J Surg Pathol. 2002;26:486-492. 10. Delahunt B. Sarcomatoid renal carcinoma: the final common dedifferentiation pathway of renal epithelial malignancies. Pathology. 1999:31:185-190. 11. Kuroda N, Toi M, Hiroi M, Enzan H. Review of Sarcomatoid renal cell carcinoma with focus on clinical and pathobiological aspects. HistolHistopathol. 2003:18:551-555. 12. Spillane A, A'Hern R, Judson I, Fisher C, Thomas J. Synovial sarcoma: a clinicopathologic, staging, and prognostic assessment. J Clin Oncol. 2000;18: 3794-3803. 13. Park SJ, Kim H, Kim C, et al. A case of renal synovial sarcoma: complete remission was induced by chemotherapy with doxorubicin and ifosfamide. Korean I Intern Med. 2004:19:62-65. 14. Limon J, Mrozek K, Mandahl N, et al. Cytogenetics of synovial sarcoma: presentation of ten new cases and review of the literature. Genes Chromosomes Cancer. 1991:3:338-345. 15. Cohen RJ, McNeal JE, Susman M, et al. Sarcomatoid renal cell carcinoma of papillary origin: a case report and cytogenetic evaluation. Arch Pathol Lab Med. 2000:124:1830-1832. 16. Dal Cin P, Sciot R, Van Poppel H, Balzarini P Roskams T, Van den Berghe H. Chromosome changes in Sarcomatoid renal carcinomas are different from those in renal cell carcinomas. Cancer Cenet Cytogenet. 2002:134:38-40. 17. Presti JC, Rao PH, Chen Q, et al. Histopathological, cytogenetic, and molecular characterization of renal cortical tumors. Cancer Res. 1991;51:1544-1552. 18. Fletcher CDM, DaI Cin P, de Wever I, et al. Correlation between clinicopathological features and karyotype in spindle cell sarcomas: a report of 130 cases from the CHAMP study group. Am J Pathol. 1999:154:1841-1847. 19. Kovacs C, Akhtar M, Beckwith B, et al. The Heidelberg classification of renal cell tumours. I Pathol. 1997:183:131-133. 20. Anglard P, Tory K, Brauch H, et al. Molecular analysis of genetic changes in the origin and development of renal cell carcinoma. Cancer Res. 1991:51: 1071-1077. Accepted for publication September 21, 2004. From Tissugen Pty Ltd (Dr Shannon), Women's and Children's Health Services, King Edward Hospital (Dr Murch), and Uropath Pty Ltd (Dr Cohen), Perth, Western Australia. Reprints: Ronald ). Cohen, FRCPA, Uropath Pty Ltd, 41 Hampden Rd, Nedlands, Western Australia 6009 (e-mail: ronnie@uropath.com. au).